Are you a thrill seeking daredevil looking for their next big adventure? These birthday party places for the brave host the best adrenaline-pumping birthday party activities in the UK. Birmingham is one of our most popular birthday party locations and one of the few places that hosts off-road buggy racing! This awesome activity lets you get behind the wheel of powerful off-road buggies and race against your friends around muddy and dusty tracks. A fast-paced and fun activity. Paintballing is available all across the UK, but why not host it in one of what’s perhaps the number one birthday party location, Leeds? An amazing activity and an even more amazing city, paintballing is a tense & thrilling game where you’ve got to be on your toes at all time. It’s immensely satisfying when you land a well-placed shot on an enemy player and a huge thrill when you’re ducking from enemy fire. Not to mention, Leeds is a fantastic city to spend a birthday night out in after the day’s done! Create your own action-packed birthday weekend packages! Go canoeing & kayaking in the Lake District. Like something out of Lord of the Rings, the stunning mountain scenery makes it the perfect spot for an unforgettable birthday party. The Lake District is also the only birthday party location where you can go Ghyll Scrambling. You’ll go clambering over rocks and sliding down mountain streams into beautiful mountain pools. Go Ape is a great and totally safe way to get over a fear of heights. Take on an obstacle course high up in the trees of Trent Park, London. Take it at your own pace and ease your way out of your comfort zone in this fun & unique outdoor activity. 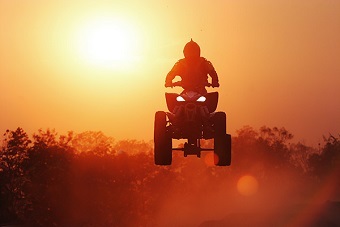 Last but not least, Quad-Biking is a perfect activity for a high-octane party, especially in large groups. It’s available all over the UK but we recommend Edinburgh for the incredible Scottish countryside you’ll be driving through. A fun-filled day and a lot of laughs awaits. These are just a few birthday party locations that host amazing action & outdoor activities. For more birthday party places for the brave or if you’re after something a bit more chill, you can find a wide variety of birthday party ideas. Call us on 0161 341 0052 for more info.